He’s Handy Manny’s handy flashlight pal. Cute, no? But hardly cupcake-like. 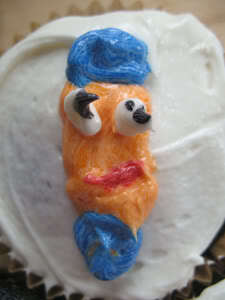 I hadn’t a clue how to go about making a cupcake that resembled him, so I did what any mother would do: I stalled. “I don’t have all the ingredients, Harry. We’ll bake them tomorrow.” This did not please him. Much back-seat screaming ensued, until I distracted him by pointing out a particularly interesting crane. But toddler memories are right up there with elephants’. When Harry woke up the next day and immediately asked if we’d be making Flicker cupcakes, I knew I was beat. These things had to be made, somehow. The cupcake itself was no problem: I’d use the Amazon Cake recipe, the simplest, most deliciousest chocolate cake in the world. But the decorating, well, that was another story. While Harry was at camp, I scrambled. Mildly panicked, I emailed my friend Sara Schneider, who bakes and decorates the most fantabulous cakes you’ve ever seen as a sideline to her real job. This woman knows decorating. 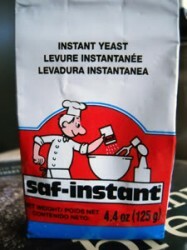 Sure enough, within minutes she’d sent me a diagram of how to proceed, and even gave me her foolproof frosting recipe. Meanwhile, Harry had spied the container of green gel paste. And as anyone who knows him—and even some people who don’t—can tell you, green is his favorite color. 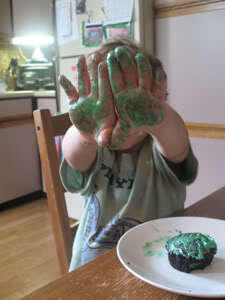 Junior was ready to abandon the Flicker idea entirely, in favor of solid green cupcakes. But dammit, we’d already gone too far! 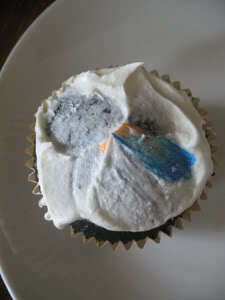 I wasn’t turning back without a Flicker cupcake to show for it. So on we went. I’m not sure I should have bothered. This guy was decorated by Salvador Dali, apparently. His cousin looks pretty good, except for those devil horns. Personally, I don’t find a double-eyeball weird at all. The winner: The only one that’s even remotely Flickerish. 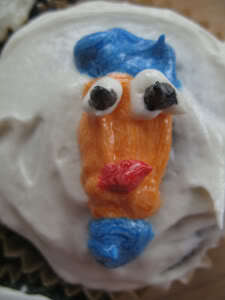 Flicker cupcake? 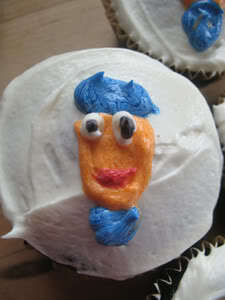 What Flicker cupcake? Remember that thing I said, about toddler memories? 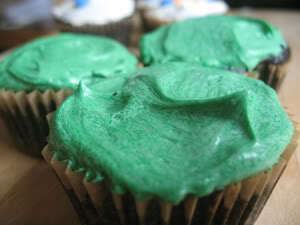 Of course, junior didn’t forget the green cupcake idea, so after making only four Flickers, he was all about the green. His favorite part? Squishing the green frosting between his hands. What a weirdo. When all the powdered sugar is in, add the vanilla & meringue powder. The mixture will be really stiff. Slowly add the milk, again scraping down the sides so it’s all combined. Beat the buttercream on high for approx 7 minutes until it’s nice and whipped. I have two sons, they are 13 and 11now, but I have fond memories of Bob the Builder, both my boys loved trucks so much, the could name a paver, dump truck, excavator by the time they were three! What a cute story. And I've seen a few handy manny shows, so as soon as you said Flicker, I knew what you were talking about! Great job, I think they turned out great! I find it interesting that you wanted to raise your child in a gender-neutral manner, yet you tweeted rather snarkily about 'the PC Police' when someone responded to your 'attention parents of truck-loving boys' post. It's worth keeping in mind our construction of gender is often un(sub?)conscious. Our (seemingly) tiny, daily assumptions and generalisations contribute much to this. I'm not trying to be snarky – I applaud that you thought consciously about your child's relationship to gender, rather than simply taking it for granted. Harry loves trucks. He also regularly cooks and bakes with his mama. Teaching boys how to cook and bake is as feminist as it gets, in my book. 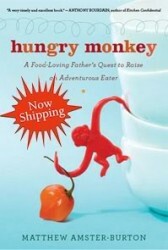 I am regularly in awe of your ability to involve Harry in your cooking/baking projects. I am so lazy I often seek to avoid the extra mess of letting my toddler "help." WTEB is one of the best food blogs around. 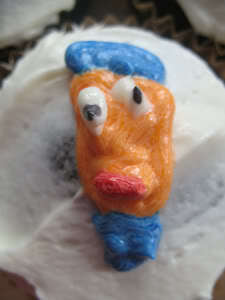 Can we get back to the far more awesome topic of cupcakes? Damn, those look good, Debbie. Your claims that the Flicker looks "terrible" does not deter my desire to scarf them. Rayna, thanks for your insight. I've been stewing over this since I first read your comment, and while I'm tempted to enter into a much larger discussion about gender and how we influence our children (as well as what constitutes "snark"), this is a food blog and I think that's where the focus belongs. 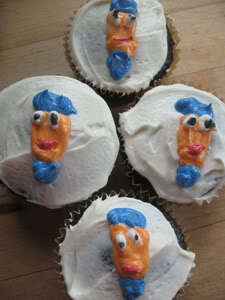 As JB so wisely suggested, let's get back to the cupcakes! Those look fabulous to me. Extremely impressive!! I have a ton of zucchini and wonder if you think adding zucchini to the amazon cake recipe would work. Would you swap out something? I'm just looking for a way to sneak in a few veggies. Hmm, that's a tricky one. I think it might throw off the texture–Amazon Cake is definitely a cakey-cake, while cakes with zucchini in them tend to be more spice-cake-like, heavier if that makes sense. OTOH, if you try it I'd LOVE to hear how it turns out! 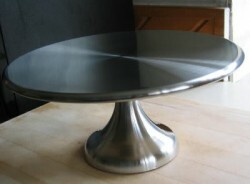 It's not vegan, but I did find this recipe for an actual Chocolate Zucchini Cake on Simply Recipes: http://www.elise.com/recipes/archives/000621chocolate_zucchini_cake.php That's a great site and I totally trust Elise's recipes. Debbie- this is hysterical! I love this. You did a great job with those flashlight guys. Cool stuff! I quite liked it.